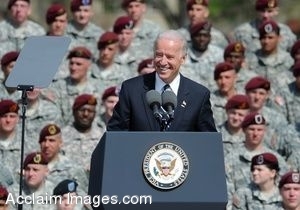 Description: Clip Art Photo of Vice President Joe Biden speaking during a welcome home ceremony for the XVIII Airborne Corps at Fort Bragg, N.C., April 8, 2009. U.S. Army photo by K. Kassens. Stock photography by Department of Defense Public Domain.